1st Team Management Team - News - Chessington & Hook United F.C. 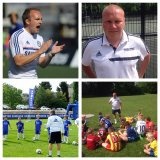 We would like to welcome new coaches Russell Banyard & James Deacons to the club. Following the resignation of Ollie Rickman as first team coach managers Darren Woods & Andy Ellis were quick to appoint his replacements. Banyard is currently a Chelsea FC academy coach so brings with him plenty of experience and knowledge of the game, he has worked alongside some world class coaches and players since being at Chelsea. Banyard has previously worked as first team coach at Epsom & Ewell helping them achieve two top 5 finishes in the prem (3rd & 5th). Russell also has worked in America for a number of years, in this time he won a State Championship. Deeks is currently part of the Pro Direct academy who coach a number of very talented youngsters, some of them are actually Chessy youth players. He also used to be apart of the Chelsea Academy setup. Banyard and Deeks both worked for David Beckham at the David Beckham Coaching Academy. They also both worked together with Epsom & Ewell youth where they coached some of our current first team players. They both have a very impressive playing career too, both at Wimbledon until the last year of YTS, more recently they have enjoyed spells at Farnborough, Banstead Athletic, Epsom & Ewell, Merstham & Corinthian Casuals just to name a few. Woodsy, Banyard & Deeks have played together since the age of 5 and have been close friends outside of football too. We hope these appointments will help move the club forward in the future, we look forward to some successful and attractive football.